Corning’s ultra-strong tech glass is getting a makeover and some new applications. Last month, Corning Incorporated announced that the company’s extremely successful Gorilla Glass is being utilized on more than 1.5 billion consumer electronics devices across the globe. Gorilla Glass can be found on a vast number of popular gadgets, including Apple iPhones and iPads, HTC’s “One” line of smartphones, and the Dell XPS Ultrabooks. The latest iteration, Gorilla Glass 3, is the cover glass of choice for Samsung’s flagship Galaxy S4 handset. The next generation of Gorilla Glass, likely to be called Gorilla Glass 4, will do more than protect consumer electronics from scratches and greasy fingerprints. Corning promises to greatly reduce the reflectiveness of its product, as well as incorporating an anti-bacterial element. 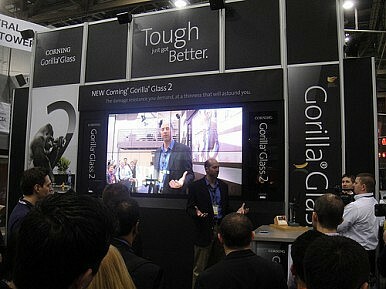 On top of the good news for consumer electronics, Gorilla Glass may be coming to automobile dealerships as well. Gorilla glass is lighter and stronger than regular glass, so incorporating it into the construction of future vehicles could reduce weight, thus boosting fuel economy. Evenson also claimed that cars using Gorilla Glass would suffer from less road noise than cars with ordinary windows. He expects at least one luxury automaker to include Gorilla Glass by the end of the year. Corning may have one more trick up its sleeve for 2013, in the form of flexible glass. The company’s new “Willow Glass” is ultra-slim and bendable. In theory, the glass could be used to cover mobile devices that can twist and roll up without breaking.